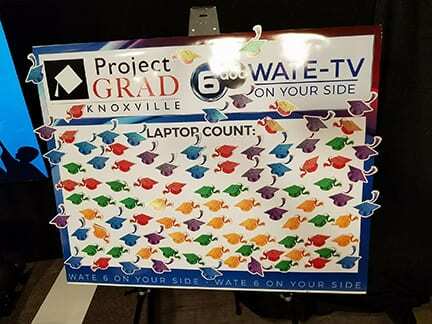 KNOXVILLE, TN — For years Project Grad , a K thru 12 public and private education partnership program in the inner city has held a drawing each year to give a lap top to one male and one female graduating senior. Lori Tucker, tv personality for WATE TV Six and a long time grad supporter had a long time vision to give every grad graduating senior a laptop, a crucial tool for college. The station crew held an all day telethon on Thursday, March 29th and the community responded by raising over 36,000.00 in a ten hour period. Project Grad, whose students are comprised of 65 percent African American and Latino , still faces a vote by the school board on whether to continue funding the program. The school board discussion will be held in the coming week. The community has been asked to attend the board meeting on April 9th when the funds will be discussed and again on April 11th when the vote will be taken to show their support for the program which has helped over 6000 inner city students every year for 17 years. Both board meetings will be held in the City county building in the large assembly room beginning at 5 pm. Previous articleNOAH to Judges: Do You Swear to Tell the Truth?